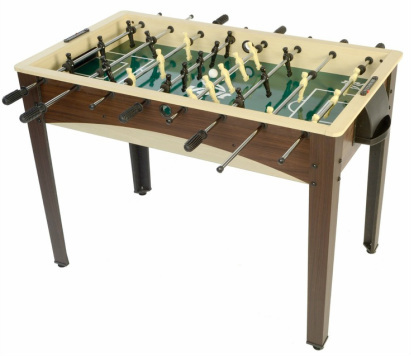 The Free Kick is a smaller 48 inch table that is great for kids. Standard size tables are 56 inches so this model offers a great little table for the price point. It is the lowest end table made by the Voit manufacturer. It features 3 man goalie, end ball returns, sliding manual scorers, and adjustable L shaped legs.